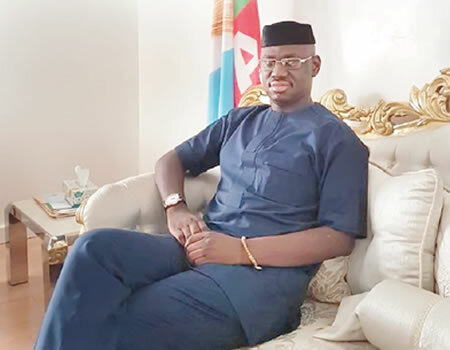 Timi Frank, former Deputy National Publicity Secretary of the All Progressives Congress (APC), has threatened to publish names and amounts paid to Adams Oshiomhole, APC National Chairman during the party primaries. He also claimed that Oshiomhole collected over $50million from different aspirants and candidates. According to Frank, a large percentage of the money was paid to Oshiomhloe through proxies from Imo, Zamfara, Adamawa, Ogun states, among others. An exclusive report by SaharaReporters on Thursday revealed that the Department of State Services (DSS) has written to President Buhari, asking him to prosecute Oshiomhole for allegedly receiving at least $55million in relation to the nationwide primaries of the party. However, in a statement signed in Abuja on Thursday, the former APC spokesman threatened to "publish the names and amounts paid to lobby the national chairman to clear aspirants and substitute the names of duly elected candidates with those that failed". "I dare say that this singular act of refusing to order the prosecution of Oshiomhole over sundry acts of bribery and corruption he committed as contained in the DSS report, President Buhari has shown that his APC-led administration is a stinking house of corruption," he said. Expressing surprise at Oshiomhole's latest ordeal, he said the former labour leader will go down in history as a party chairman who allegedly received such "humongous bribe within a short period of time in office". Frank, however, called on the president to act on the recommendations of the DSS by ordering "Oshiomhole's sack and prosecution, if his (Buhari) government is actually fighting corruption or opposition". He continued: "We are in the know that President Muhammadu Buhari has received the DSS report on Adams Oshiomhole and Nigerians are patiently waiting for the action or inaction of his government, because this is an administration that has claimed fighting corruption as an achievement. In the history of party administration in Nigeria, no party chairman has been accused of collecting the jaw-breaking amount of money allegedly collected within a short period in office like Comrade Oshiomhole has allegedly done. Instead of Oshiomhole to clear his name, he has taken to diversionary path asking the Senate President, Senator Bukola Saraki to resign. Nigerians are not gullible. We shall wait to see how the acclaimed anti-corruption regime will act on this particular issue. This same Oshiomhole has been attacking the Senate President, calling on him to resign on moral ground. Can Oshiomhole now step aside while investigation into his financial malfeasance is ongoing to justify his much talked about morality?"